Crush 1 cookie; set aside. Place 4 cookies, ice, ice cream, vodka, 1 oz. caramel fudge, cinnamon and ginger in blender. Process until smooth. 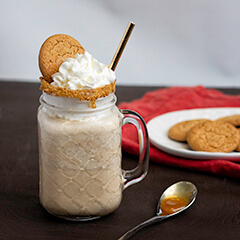 Rim 16-ounce glass with remaining caramel fudge and dip in cookie crumbs. Pour mixture into glass. Top with Reddi-wip and garnish with remaining cookie. Serve immediately.